I allowed myself a day off to go walkabout yesterday. The UK retailers are having sales galore. Temptation at every turn to spend, spend, spend. It’s a bit weird as it’s the summer stuff they are moving out to make way for the new winter fashions. Back in South Africa we are still in winter which means we are a year behind. Yikes! But mostly I look for ideas and see what I could easily make myself. I managed to dredge up another project I did before I left home. 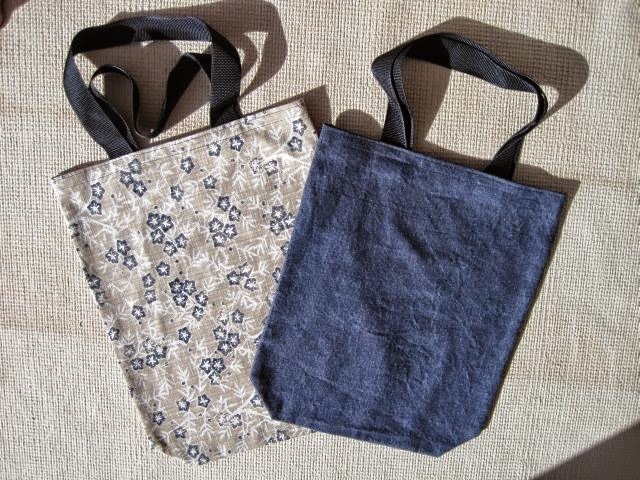 In the picture are some easy tote bags I made. I found some bright and funky ones – here – and more or less used the pattern. Love that blog. To see how I made them go to – this blog post. Tote bags are so simple to make that it would be difficult to mess up. Especially if, like these two, you buy the handles and don’t have to sew them yourself. The only part you would need to figure out is how big, what shape and what colour fabric to use.